I can't say I'm a huge fan of artichokes. My closest encounter has been in the form of the artichoke dip on the appetizer menu of restaurant chains like Applebees and Olive Garden. I thoroughly love it in this form, but have only seen the vegetable prepared and eaten in it's entirety on cook shows. Most of the time it's either steamed or boiled, and in some cases sauteed. The makeup of the vegetable with its seemingly endless leaves and inner 'heart' or flower, the actual choke of the artichoke, seems to demand a slow and patient preparation and eating experience. The vegetable itself seems so distinquished, like a crown sitting on a plate; the dinner party or special occasion vs the every day meal type of food item. But today, after looking at Lidia's Italian Kitchen Cook Show on public network, I suddenly saw the artichoke in a new light. The always charismatic Italian Cuisine Guru, Lidia, showcased the artichoke bringing it to life through her trips to farmers' markets and farms in Rome, Italy. She prepared the delicate vegetable with care and love explaining all elements of it to her audience. It was the artichoke's shining moment. Plus, on my trip to the 'Three Guys From Brooklyn' market this week, I noticed the beautiful artichoke for the first time in a long time. These events can't be coincidental. I've decided they can only mean that the this vegetable is definitely screaming for my attention. So I'm taking a closer look at my friend, the artichoke. One of the first things I did was to go to the USDA's Database to get a detailed overview of its nutritional value. The artichoke is extremely low in calories and fat. Well I already knew that, but was surprised to find that a medium sized artichoke only packs 60 kcals. It is very low in sodium as well. It also has varying amounts of potassium, folate, magnesium, phosphorus, and calcium and other nutrients. But it is particulary high in antioxidants. 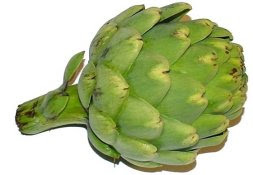 Fresh artichokes should be stored in the refrigerator, unwashed and in a plastic bag. It is preferable to use the artichoke the same day, but it can keep in the refrigerator for four days to a week. Cooking artichoke does require some care so that the leaves stay intact or you could choose to remove the leaves all together and just concentrate on the 'choke' itself. Consumption involves peeling off each individual leaf one at a time, dipping in a sauce or melted butter if desired, and scraping the softer edible portion on the inside of the leaves with your teeth. If all of this seems too much of an introduction, I suggest buying the canned artichoke 'hearts'. The only concern I have with canned vegetables is the sodium content. But I use them because they are convenient and easy, plus they are harvested at their pick before going through the canning process. I always wash them in cold water to take out some of the sodium and then it's just about the adjusting the salt in your dishes to futher balance the sodium. So after unmasking this vegetable a little more, I'm personally willing to get past it sophisticated persona and give it a little more show in my meals. I'm looking forward to taking artichokes further than the appetizer dip this summer. What about you?